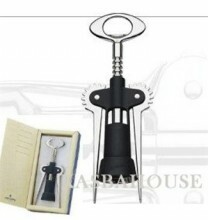 This oversized corkscrew is 9.5 inches long and comes with rubber soft touch handles for a comfortable grip. Gift boxed. Made in Italy. Click the button below to add the Deluxe Rubber Touch Ghidini Corkscrew to your wish list.